Here we present a community accepted protocol in multimedia format for subretinally injecting a bolus of RPE cells in rats and mice. This approach can be used for determining rescue potentials, safety profiles, and survival capacities of grafted RPE cells upon implantation in animal models of retinal degeneration. Westenskow, P. D., Kurihara, T., Bravo, S., Feitelberg, D., Sedillo, Z. A., Aguilar, E., Friedlander, M. Performing Subretinal Injections in Rodents to Deliver Retinal Pigment Epithelium Cells in Suspension. J. Vis. Exp. (95), e52247, doi:10.3791/52247 (2015). The conversion of light into electrical impulses occurs in the outer retina and is accomplished largely by rod and cone photoreceptors and retinal pigment epithelium (RPE) cells. RPE provide critical support for photoreceptors and death or dysfunction of RPE cells is characteristic of age-related macular degeneration (AMD), the leading cause of permanent vision loss in people age 55 and older. While no cure for AMD has been identified, implantation of healthy RPE in diseased eyes may prove to be an effective treatment, and large numbers of RPE cells can be readily generated from pluripotent stem cells. Several interesting questions regarding the safety and efficacy of RPE cell delivery can still be examined in animal models, and well-accepted protocols used to inject RPE have been developed. The technique described here has been used by multiple groups in various studies and involves first creating a hole in the eye with a sharp needle. Then a syringe with a blunt needle loaded with cells is inserted through the hole and passed through the vitreous until it gently touches the RPE. Using this injection method, which is relatively simple and requires minimal equipment, we achieve consistent and efficient integration of stem cell-derived RPE cells in between the host RPE that prevents significant amount of photoreceptor degeneration in animal models. While not part of the actual protocol, we also describe how to determine the extent of the trauma induced by the injection, and how to verify that the cells were injected into the subretinal space using in vivo imaging modalities. Finally, the use of this protocol is not limited to RPE cells; it may be used to inject any compound or cell into the subretinal space. The sensory retina is organized in functional tiers of neurons, glia, and endothelial cells. Photoreceptors at the back of the retina are activated by light; through phototransduction they convert photons into electrical signals that are refined by interneurons and transmitted to the visual cortex in the brain. Phototransduction cannot occur without the coordinated efforts of Mueller glia and retinal pigment epithelium (RPE) cells. RPE are organized in a monolayer directly behind the photoreceptors and perform multiple and diverse functions integral to photoreceptor function and homeostasis. In fact, RPE and photoreceptors are so co-dependent that they are considered to be one functional unit. Death or dysfunction of RPE results in devastating secondary effects on photoreceptors and is associated with age-related macular degeneration (AMD), the leading cause of blindness in the elderly1,2. While no cure has been discovered for AMD, several clinical studies have shown that RPE cell replacement may be a promising therapeutic option3-13. With the advent of stem cell technology, it is now possible to generate large numbers of RPE cells in vitro from embryonic and induced pluripotent stem cells (hES and hiPS) that strongly resemble their somatic counterparts functionally and anatomically14-26. Stem cell-derived RPE have also been shown to function in vivo by multiple independent groups, including our own, to significantly slow retinal degeneration in rat and mouse lines with spontaneous retinal degeneration16,18,21,22,25,28,29. This combination of clinical and preclinical supporting evidence is so compelling that several clinical trials to prevent retinal degeneration using stem cell-derived RPE cells are now ongoing30,31. The technique outlined in this manuscript cannot be visualized and trauma is unavoidable (as with any subretinal injection technique). It is performed by making a hole just under the limbus vessels and inserting a blunt needle along a transscleral route to inject a bolus of cells under the diametrically opposed retina. The person doing the injection will feel resistance as the blunt needle touches the retina. The cells may be directly visualized after the injection, however, and the degree of the induced retinal detachment can be determined by labeling the RPE cells with a transient fluorescent marker and detecting them with a confocal scanning ophthalmoscope (cSLO). An optical coherence tomography (OCT) system can also be used to monitor the trauma and easily identify the injection site. NOTE: All animals were treated in accordance with the ethical guidelines established by the Scripps Research Institute. Pre-warm cell dissociation solution (preferably one that is inactivated through dilution, not with serum), sterile PBS, and culture media (Table 1). Sterilize the syringe with a blunt needle by disassembling it and boiling the parts in water for 15 min. Detach the RPE cells using pre-warmed cell dissociation solution for 5-8 min at 37 °C. Scrape the cells gently to release any that are still attached. Dilute the cells with a large volume of culture media (fill up a 15 ml tube) to inactivate the dissociation solution and count them. Centrifuge at 800 x g for 5 min to pellet the cells. Resuspend the cells at 200,000 cells/µl (to deliver 100,000 cells in a 0.5 µl volume) in sterile pre-warmed PBS and transfer them into a 1.5 ml microcentrifuge tube. Optionally, add a live cell transient fluorescent marker and incubate at 37 °C for 30-45 min. Load the syringe with a blunt needle with 0.5 µl of cells. Inject the cells as soon as possible. NOTE: If possible, learn the technique with adult albino rats since the limbus vessels are much easier to visualize. Inject Fast Green solution when learning (before trying to inject cells) to more easily facilitate visualization of the injection site. Anesthetize the rodent. Use intraperitoneal injections of 100 mg/ml ketamine and 10 mg/ml xylazine (20 µl/10 g body weight) over isofluorane inhalation since it is difficult to maneuver the rodent and inject into the eye with the snout in the inhaler. Ensure that the animal is deeply anesthetized by pinching one of its paws. If it flinches, wait several more minutes and try again before beginning the subretinal injection. Position the rodent onto its side so that the eye that will be injected is facing the ceiling. Under a dissecting microscope gently stretch the skin so the eye pops slightly up out of the socket (temporary proptosis) and becomes more accessible by holding its head with two fingers just above the ear and by its jaw and gently stretch the skin parallel to the eyelids so that the eye pops slightly up out of the socket (See Figure 1C). Do not grasp the rodent too close to the throat. With a 30 G sharp disposable pre-sterilized needle, make a hole immediately below the limbus (if the vessels are hit, bleeding will be significant and it be difficult to find the hole later) and at an angle to avoid touching the lens with the needle (Figure 1D). Avoid touching the lens with the sharp (or blunt) needle or immediate cataract formation will occur. NOTE: Injections work better with two people. In this way one person can pass the syringe with the blunt needle to the person performing the injection after they have created the first hole with the sharp disposable needle to maintain focus on the where the hole is. Retract the disposable sharp needle from the eye while maintaining the grip on the head. Remember exactly where the hole is. After either mounting the pre-loaded syringe with a blunt needle on a micromanipulator or holding it by hand, insert the tip of the syringe with the blunt needle through the hole, taking care again not to touch the lens and gently push it through the eye very gently until feeling resistance (Figure 1D). Keeping all movements to a minimum, carefully inject the RPE cells slowly into the subretinal space. NOTE: RPE/retina detachment will be induced; this is unavoidable. However, a cleaner injection minimizes the detachment and greatly improves the chances of reattachment (Figure 1E). Any exaggerated movements may move the needle back into the retina, and sideways movements can damage the retina. The use of an injection pump is optional but allows for a very precise delivery. Retract the syringe slowly. Apply eye moisturizing drops to keep the eye hydrated. Continue to monitor the animal until it regains sternal recumbency. Do not leave animal unattended or return to a cage with other alert animals until it regains sternal recumbency. We can deliver a suspension of RPE cells into the subretinal space of rodents quickly and consistently using the technique described in this manuscript. While not required, traumas can be greatly minimized using the setup shown with a micromanipulator in Figure 1A&B. Hold the rodent as shown in Figure 1C for temporary proptosis. The steps are the same if performed with the micromanipulator or by hand; these are depicted in the cartoon in Figure 1D. When performed cleanly fluorescence from the labeled RPE cells can be detected using a cSLO and the induced retinal detachment can be seen using an OCT system (Figure 2). 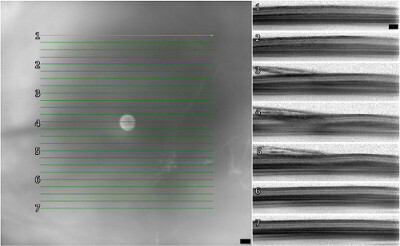 In Figure 3 a cSLO was used to capture multiple images around the entire injection site (the images from Figure 2 and Figure 3 were captured immediately following the subretinal injection). Note the detachment that is most profound (but not severe) in the center images (3-5). Figure 1. The subretinal injection platform and a cartoon depiction of the injection technique. (A) Holes were drilled into a metal plate to affix the dissecting microscope. (B) A micromanipulator on a magnetic stand can be moved in and out of position during the injections. (C) Hold the rodent as shown for temporary proptosis. (D) Depiction of the key structures of the eye. (D; Step 3.4) A hole is made in the eye with a sharp disposable needle just underneath the limbus and lens. (D; Step 3.6) A blunt needle is inserted into the hole and through the diametrically opposed retina until gently touching the RPE. (D; Step 3.8) Injection of the cells induces a temporary retinal detachment. Please click here to view a larger version of this figure. Figure 2. Fundus images taken directly after subretinal injection. (A) The green fluorescence observed in the right panel (overlay of the IR and FAF images) is emitted from iPS-RPE cells labeled with a transient fluorescent marker. (B) Retinal detachment of the neural retina and RPE is observed near the injection site after subretinal injection (marked with arrow). Asterisk in (A) labels the optic nerve. (This figure is being republished in its original format from Krohne et al.21) Scale bar = 200 µm Please click here to view a larger version of this figure. In this article we describe a relatively simple method for performing subretinal injections of RPE cells in suspension in rats and mice. The protocol is easy to learn and more experience with the technique will translate in fewer traumas (Figure 3; this represents one of the better injections), especially if a micromanipulator is used (Figure 1A). Any trauma can be monitored in vivo with a cSLO and OCT system (Figure 2) if available. If higher resolution and less noisy images are desired, state of the art imaging platforms are available, along with excellent protocols for performing OCT in murine disease models39-41. 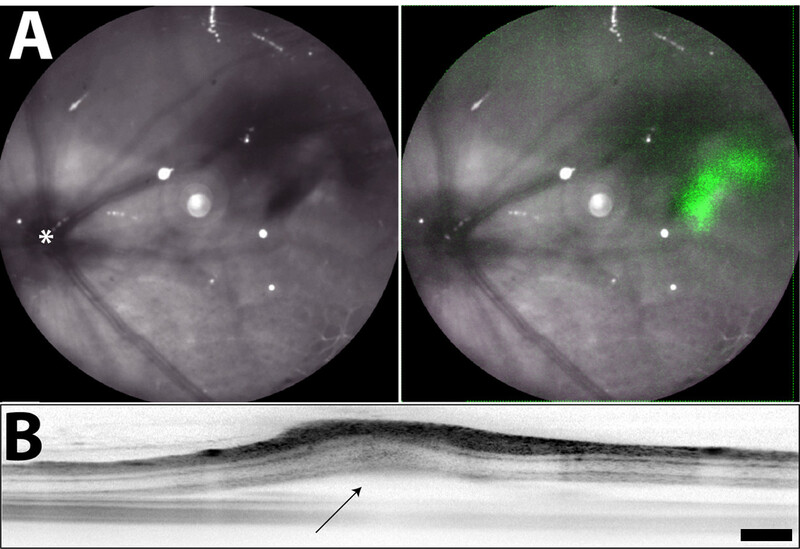 The most common complications associated with this technique arise from improper positioning of the animal during the surgery, inducing excessive retinal detachment, causing choroidal hemorrhages, and reflux of RPE cells from the needle. If positioned inappropriately, it will be difficult to create the first hole, and even harder to find it after. Shifting of the eye could obscure the hole, making penetration with the blunt needle impossible. While it is possible to make another hole with a sharp needle, this creates more trauma. Pronounced retinal detachments can result in severe visual loss. Detachments induce characteristic morphological changes in retinal neurons and glia; these combinations of reactive gliosis and retinal remodeling can promote photoreceptor cell death42. Finally, if too much pressure is applied with the syringe with the blunt tip, choroidal hemorrhaging can be induced. If far too much pressure is applied, breakthrough of the RPE and Bruch’s membrane can occur and some iPS-RPE can be observed in the choroid, although these instances are rare. Reflux of injected RPE cells into the retina and vitreous occurs more frequently, and is difficult to avoid. This can be minimized by retracting the syringe with the blunt needle very slowly after the injection (in this regard the micromanipulator is incredibly useful). Other techniques used in the field are more sophisticated but are also significantly more challenging (for review see Ramsden et al.30). It is possible to inject cells in suspension into the subretinal space by inserting a sharp needle in the opposite direction through the sclera, choroid, and RPE. This technique requires significantly more practice and expertise; until mastered, most of the RPE cells will be injected into the choroid or retina and never integrate into the subretinal space. (Also, due to limited access of the eye, this approach is unsuitable for use in human patients.) It is also possible to implant intact monolayers of polarized RPE43. This is done either by unrolling a sheet of RPE cells underneath the retina through a slit, or by growing the cells on an artificial porous substrate and inserting both the cells and prosthetic into the subretinal space. 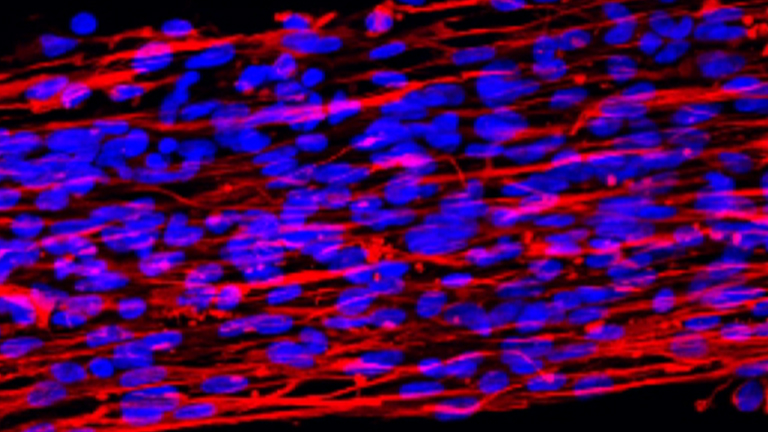 The advantages of these techniques are obvious as the RPE cells do not need to “repolarize” upon implantation, and the potential formation of pigmented spheres of RPE cells that escape into the retina can be largely avoided16,44. However, these surgical techniques are inherently even more complicated. Furthermore, in humans, the RPE and prosthetic will need to be inserted under the macula through a slit that must be cauterized with a laser. This will result in retinal degeneration around the cauterized region. The advantage of using the protocol outlined here is that it can be performed reliability, is the easiest to learn, and can be used to deliver other compounds or cells besides RPE. Furthermore, with slight modifications (using the sharp needle rather than the blunt needle to deliver the cells), this same technique can be used to deliver cells or drugs intravitreally. We achieve consistent results with this technique, and have learned to minimize the trauma associated with the technique through experience and through in vivo imaging monitoring. We wish to thank Alison Dorsey for helping to develop the subretinal injection technique. We also acknowledge the National Eye Institute (NEI grants EY11254 and EY021416), California Institute for Regenerative Medicine (CIRM grant TR1-01219), and the Lowy Medical Research Institute (LMRI) for very generous funding for this project. Jong, P. T. Age-related macular degeneration. Med, N. . E. ngl. J. . 355, (14), 1474-1485 (2006). Abe, T. Auto iris pigment epithelial cell transplantation in patients with age-related macular degeneration: short-term results. The Tohoku Journal Of Experimental Medicine. 191, (1), 7-20 (2000). Algvere, P. V., Berglin, L., Gouras, P., Sheng, Y. Transplantation of fetal retinal pigment epithelium in age-related macular degeneration with subfoveal neovascularization. Graefes Arch. Clin. Exp. Ophthalmol. 232, 707-716 (1994). Binder, S. Outcome of transplantation of autologous retinal pigment epithelium in age-related macular degeneration: a prospective trial. Invest. Ophthalmol. Vis. Sci. 45, (11), 4151-4160 (2004). Binder, S. Transplantation of autologous retinal pigment epithelium in eyes with foveal neovascularization resulting from age-related macular degeneration: a pilot study. Am. J. Ophthalmol. 133, (2), 215-225 (2002). Juan, E., Loewenstein, A., Bressler, N. M., Alexander, J. Translocation of the retina for management of subfoveal choroidal neovascularization II: a preliminary report in humans. Am. J. Ophthalmol. 125, (5), 635-646 (1998). Joussen, A. M. How complete is successful 'Autologous retinal pigment epithelium and choriod translocation in patients with exsudative age-related macular degeneration: a short-term follow-up' by Jan van Meurs and P.R. van Biesen. Graefes. Arch. Clin. Exp. Ophthalmol. 241, (12), 966-967 (2003). Lai, J. C. Visual outcomes following macular translocation with 360-degree peripheral retinectomy. Arch. Ophthalmol. 120, (10), 1317-1324 (2002). Machemer, R., Steinhorst, U. H. Retinal separation, retinotomy, and macular relocation: II. A surgical approach for age-related macular degeneration? Graefes. Arch. Clin. Exp. Ophthalmol. 231, (11), 635-641 (1993). MacLaren, R. E. Autologous transplantation of the retinal pigment epithelium and choroid in the treatment of neovascular age-related macular degeneration. Ophthalmology. 114, (3), 561-570 (2007). Carr, A. J. Molecular characterization and functional analysis of phagocytosis by human embryonic stem cell-derived RPE cells using a novel human retinal assay. Mol. Vis. 15, (4), 283-295 (2009). Lund, R. D. Human embryonic stem cell-derived cells rescue visual function in dystrophic RCS rats. Cloning Stem Cells. 8, (3), 189-199 (2006). Osakada, F. In vitro differentiation of retinal cells from human pluripotent stem cells by small-molecule induction. J. Cell Sci. 122, (17), 3169-3179 (2009). Vugler, A. Elucidating the phenomenon of HESC-derived RPE: anatomy of cell genesis, expansion and retinal transplantation. Exp. Neurol. 214, (2), 347-361 (2008). Westenskow, P. D. Using flow cytometry to compare the dynamics of photoreceptor outer segment phagocytosis in iPS-derived RPE cells. Invest. Ophthalmol. Vis. Sci. 53, (10), 6282-6290 (2012). Zarbin, M. A. Current concepts in the pathogenesis of age-related macular degeneration. Arch. Ophthalmol. 122, (10), 598-614 (2004). Li, Y., et al. Long-term safety and efficacy of human-induced pluripotent stem cell (iPS) grafts in a preclinical model of retinitis pigmentosa. Molecular Medicine. 18, 1312-1319 (2012). Wang, N. K. Transplantation of reprogrammed embryonic stem cells improves visual function in a mouse model for retinitis pigmentosa). Transplantation. 89, (8), 911-919 (2010). Ramsden, C. M. Stem cells in retinal regeneration: past, present and future. Development. 140, (12), 2576-2585 (2013). Carr, A. J. Development of human embryonic stem cell therapies for age-related macular degeneration. Trends in Neurosciences. 36, (7), 385-395 (2013). Westenskow, P., Sedillo, Z., Friedlander, M. Efficient Derivation of Retinal Pigment Epithelium Cells from iPS. J. Vis. Exp. Forthcoming Forthcoming. Furhmann, S., Levine, E. M., Friedlander, M. Extraocular mesenchyme patterns the optic vesicle during early eye development in the embryonic chick. Development. 127, (21), 4599-4609 (2000). Eberle, D., Santos-Ferreira, T., Grahl, S., Ader, M. Subretinal transplantation of MACS purified photoreceptor precursor cells into the adult mouse retina. Journal Of Visualized Experiments. e50932 (2014). Huber, G. Spectral domain optical coherence tomography in mouse models of retinal degeneration. Invest. Ophthalmol. Vis. Sci. 50, 5888-5895 (2009). Kim, K. H. Monitoring mouse retinal degeneration with high-resolution spectral-domain optical coherence tomography. Journal of Vision. 53, (8), 4644-4656 (2008). Pennesi, M. E. Long-term characterization of retinal degeneration in rd1 and rd10 mice using spectral domain optical coherence tomography. Invest. Ophthalmol. Vis. Sci. 53, 4644-4656 (2012). Fisher, S. K., Lewis, G. P., Linberg, K. A., Verardo, M. R. Cellular remodeling in mammalian retina: results from studies of experimental retinal detachment. Progress in Retinal And Eye Research. 24, (3), 395-431 (2005). Hu, Y. A novel approach for subretinal implantation of ultrathin substrates containing stem cell-derived retinal pigment epithelium monolayer. Ophthalmic Research. 48, (4), 186-191 (2012). Diniz, B. Subretinal implantation of retinal pigment epithelial cells derived from human embryonic stem cells: improved survival when implanted as a monolayer. Invest. Ophthalmol. Vis. Sci. 54, (7), 5087-5096 (2013).